Although not a ‘Ram’ Kangaroo armoured personnel carrier, another conversion of Ram, Mark II tanks, was to that of an armoured ammunition carrier, to replenish the tanks of armoured and armoured reconnaissance regiments, with ammunition, fuel, and personnel, during ‘active’ operations. This conversion consisted of the removal of the complete turret, with the turret ring and ball-race1 remaining in place, and the removal of the internal ammunition bins and racks. The No. 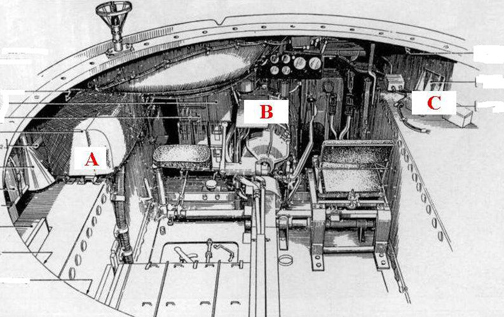 19 Wireless Set (a radio)2 was reinstalled in the left-hull pannier3, on the left of the bow machine gunner’s position, and the vehicle batteries were moved from the hull floor, up into the rear of the left-hull pannier. A circular 1-inch (14-millimetre) thick armoured plate, with a 28-inch (71-centimetre) square door (with two 14×14-inches (36×36-centimetres) hinged hatches), in the centre, was placed over the turret ring and ball-race (enabling the armoured plate to be rotated), with a 7-inch (18-centimetre) high splash plate4, being installed around the 28-inch (71-centimetre) square double hinged hatches. The drive shaft was also to be covered over, as in the conversion of Ram tanks, to that of ‘Ram’ armoured gun towers, as mentioned in the ‘Ram’ Kangaroo armoured personnel carrier, Part 2, of 27 October 2014. This would account for the references in some contemporary accounts of the drive shaft being covered over, as part of the initial conversion of Ram, Mark II tanks, to that of ‘Ram’ armoured personnel carriers, when in fact, only those ‘Ram’ armoured personnel carriers, based on the conversion of ‘Ram’ armoured gun towers, would have the drive shaft covered over. 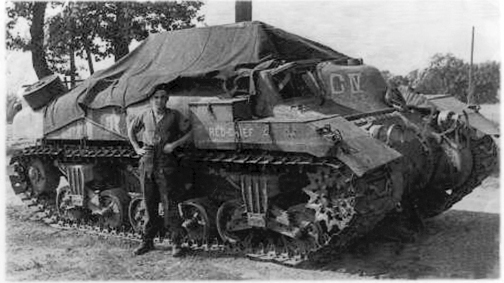 One innovation, which wasn’t part of any conversion of Ram tanks or Ram armoured gun towers, to that of armoured personnel carriers, was that of ‘tarp/bivouac’ supports, which were improvised by the crew members of ‘Ram’ armoured personnel carriers, themselves, for use with the large vehicle tarpaulin. These supports (or poles) either were crescent shaped, or had a downward leg at either end of a straight pole, and were mounted into any of the bolt holes left in the circular opening of the hull top, by the removal of the turret ring during the initial conversion of Ram tanks to either Ram armoured gun towers, or that of ‘Ram’ armoured personnel carriers. Once in place, the large vehicle tarpaulin could be put up over these, leaving an opening at the front for the crew to enter or exit the carrier, while keeping the elements out (i.e., rain or snow). These ‘tarp/bivouac’ supports, were normally used when the crew knew that they were going to be in a static position for a time, and could easily be cleared away and stowed before they had to move off again. 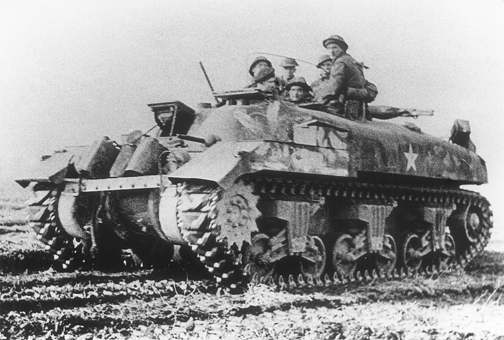 On 14 October 1944, in a letter, in which First Canadian Army Headquarters, informed Canadian Military Headquarters (London), that 162 ‘Ram’ Kangaroo armoured personnel carriers would be required, to form the Canadian armoured personnel carrier regiment, consisting of two squadrons of 53 carriers each, and a reserve of 50 armoured personnel carriers, an entitlement for six ‘Ram’ armoured ammunition carriers, was allotted to the 1st Canadian Armoured Personnel Carrier Regiment, Canadian Armoured Corps. These six ‘Ram’ armoured ammunition carriers, were to be used as ‘command’ carriers, within the regiment. Two each, were to be held by Regimental Headquarters, “A” Squadron Headquarters, and “B” Squadron Headquarters. As of 21 November 1944, 1st Canadian Armoured Personnel Carrier Regiment, Canadian Armoured Corps, held four (CT159532, CT159702, CT1598715, and CT159896) of their entitlement of six ‘Ram’ armoured ammunition carriers. At this time, First Canadian Army Headquarters decided that there was no priority for the issue of the remaining two, and that their issue be deferred until such time as either, 1st Canadian Armoured Personnel Carrier Regiment, was under command of First Canadian Army6, or that the two were particularly requested. 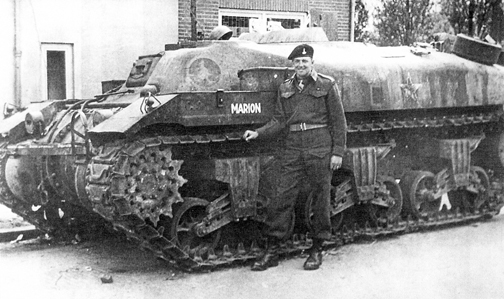 However, that being said, a fifth ‘Ram’ armoured ammunition carrier, CT159891 (named MARION), was issued to the regiment sometime after 21 November 1944, and remained in service with 1st Canadian Armoured Personnel Carrier Regiment, as a ‘command’ carrier. These ‘command’ carriers, would have been among those designated carriers that were fitted with a second No. 19 Wireless Set, or with No. 18, No. 22, or No. 38 Wireless Sets, as the need arose, as referred to in the ‘Ram’ Kangaroo armoured personnel carrier, Part 2, of 27 October 2014. As mentioned in the ‘Ram’ Kangaroo armoured personnel carrier, Part 1, of 16 October 2014, part of the initial conversion of the Ram, Mark II tank, to that of a ‘Ram’ armoured personnel carrier, was the repositioning of the No. 19 Wireless Set in the forward left-hull pannier, and as noted above, was also the case with the initial conversion of Ram, Mark II tanks, to that of ‘Ram’ armoured ammunition carriers. One interesting revelation which came to light, as 1st Canadian Armoured Personnel Carrier Regiment started receiving ‘Ram’ Kangaroo armoured personnel carriers, was that, in some cases, the No. 19 Wireless Set was mounted to far forward in the left-hull pannier, thus overhanging the edge of the pannier and protruding into the carrier, which restricted the traverse of the bow ball-mounted .30-calibre Browning machine gun, to the right by 5-degrees. This overhanging of the edge of the pannier and protruding into the carrier, of the No. 19 Wireless Set, was also noted in those ‘Ram’ armoured ammunition carriers, that had been initial conversions of earlier Ram, Mark II tanks, which had an auxiliary turret, on the left front of the tank. Although the problems mentioned above, had been rectified in ‘Ram’ armoured gun towers, converted to ‘Ram’ armoured personnel carriers, by mounting the No. 19 Wireless Set over the transmission, between the co-driver’s, and driver’s position, as mentioned in the ‘Ram’ Kangaroo armoured personnel carrier, Part 2, of 27 October 2014. While awaiting a response to this latest problem (from Canadian Military Headquarters (London)) of the wireless set being mounted to far forward in the left-hull pannier, 1st Canadian Armoured Personnel Carrier Regiment Signal Troop, Royal Canadian Corps of Signals, as an expedient measure, remounted the No. 19 Wireless Set in the forward right-hull pannier, of those carriers, in which the mounting of the wireless set in the forward left-hull pannier, was causing problems with the protrusion of the set into the carrier, or that was interfering with the operation of the bow mounted .30-calibre Browning machine gun. In January 1945, having been notified of what measures 1st Canadian Armoured Personnel Carrier Regiment Signal Troop, had taken to rectify the problem with the No. 19 Wireless Set mounting, the Deputy Director of Mechanical Engineering, First Canadian Army7, in a letter dated 17 January, recommended to First Canadian Army Headquarters, that they make representation to Canadian Military Headquarters (London), that this work be done in the United Kingdom, prior to replacement ‘Ram’ armoured personnel carriers, being shipped over to North-West Europe. Although, as stated earlier, the No. 19 Wireless Set was to have been mounted in the forward left-hull pannier of ‘Ram’ armoured personnel carriers, the reality was, that it could, and was, mounted in one of the three positions, as mentioned above, either in the forward left-hull pannier, or in the centre-front over the transmission, between the co-driver’s, and driver’s position, or in the forward right-hull pannier. Those ‘Ram’ armoured personnel carriers that were eventually equipped with a second No. 19 Wireless Set, would have had it mounted in one of these three positions, as well. A diagram of the interior of a ‘Ram’ Kangaroo armoured personnel carrier showing the three possible mounting positions for the No. 19 Wireless Set, as explained in the text. C – in the forward right-hull pannier. Source: Author’s collection. Also, as of 14 October 1944, with Canadian requirements having been met, for the foreseeable future, for the conversion of Ram, Mark II tanks, to either armoured personnel carriers, armoured gun towers, or armoured ammunition carriers, Canadian Military Headquarters (London), agreed to provide the British with 330 Ram tanks8, subject to financial agreement, to meet their armoured personnel carrier needs, since on 11 October, Headquarters 21st Army Group, had authorized the formation of a second armoured personnel carrier regiment, to support the Second British Army. Having obtained approval from National Defence Headquarters (Ottawa), these 330 Ram tanks, were released to the British in mid-December 1944, with the understanding that any additional ‘Ram’ armoured personnel carriers required by First Canadian Army, would come from this source. This was accepted by the British War Office9, on 21 December 1944, under the understanding, that a financial adjustment would be made for any issued to First Canadian Army. 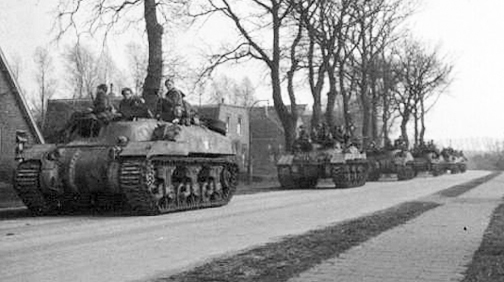 Having spent November and December 1944, in Tilburg, Holland, readying themselves and their ‘Ram’ Kangaroo armoured personnel carriers for battle, the 1st Canadian Armoured Personnel Carrier Regiment, Canadian Armoured Corps, resumed active operations on 8 January 1945, when two Troops from “B” Squadron lifted two companies of the British 1st Battalion, The Suffolk Regiment10, in an attack near Venray, Holland. 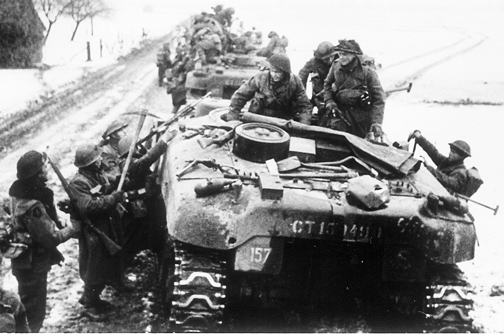 From this attack to the end of hostilities in North-West Europe, on 5 May 1945, the ‘Ram’ Kangaroo armoured personnel carriers of the 1st Canadian Armoured Personnel Carrier Regiment, were continually in action, carrying infantrymen of both the First Canadian Army, and of the Second British Army, into battle. Although the pace of these operations limited thorough maintenance, in a workshop setting, the ‘Ram’ Kangaroo armoured personnel carriers of 1st Canadian Armoured Personnel Carrier Regiment, were kept in serviceable condition throughout, by the valiant efforts the men of No. 123 Light Aid Detachment (Type E), Royal Canadian Electrical and Mechanical Engineers, which during the more fluid operations in which the regiment was involved in, would split into two sections. “A” Section, would accompany “A” Squadron, with “B” Section, accompanying “B” Squadron, to aid the crews of the regiments ‘Ram’ Kangaroo armoured personnel carriers, in both maintenance and repair tasks, as the need arose. On 9 March 1945, in preparation for the forthcoming crossing of the River Rhine (Operation PLUNDER), “B” Squadron, was ordered into workshops, followed by “A” Squadron (on 11 March), for a major overhaul and refitting of their ‘Ram’ Kangaroo armoured personnel carriers. By 20 March, both squadrons had returned from workshops, during which as part of the refitting process, their ‘Ram’ Kangaroo armoured personnel carriers, had been equipped with the new track extended end connectors. These end connectors greatly widened the width of the track, which in turn, further reduced the track pressure resulting in better performance on soft ground. By April 1945, the Ram tanks upon which the ‘Ram’ Kangaroo armoured personnel carriers, was based, were now two to three years old. Prior to conversion to armoured personnel carriers, these Ram tanks had been used extensively in the United Kingdom for training purposes by units of the Canadian Armoured Corps, before being converted to ‘Ram’ armoured personnel carriers, and having been, more or less in continuous use since arriving in North-West Europe, were now showing their age. 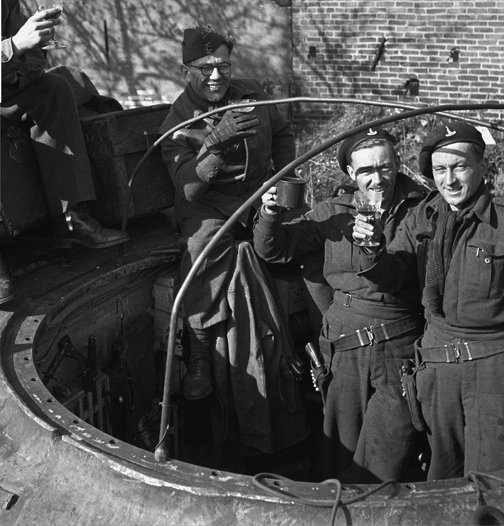 Both the men of the 1st Canadian Armoured Personnel Carrier Regiment, and those of No. 123 Light Aid Detachment (Type E), Royal Canadian Electrical and Mechanical Engineers, worked heroically to keep them maintained and ready for battle. As testament to the work of both the crew members, and of No. 123 Light Aid Detachment, in keeping their carriers in serviceable condition, and in response to some maintenance issues that were raised while his regiments armoured personnel carriers, were in workshops during March, Lieutenant-Colonel Churchill, Commanding Officer, 1st Canadian Armoured Personnel Carrier Regiment, in a letter of 4 April 1945, to the Brigadier, Royal Armoured Corps11, First Canadian Army Headquarters, stated, that at no time had a Kangaroo failed to reach the objective, once an attack had commenced, unless it had been knocked out by enemy anti-tank fire, or suffered damage from enemy land mines, or had become stuck in mud, or had been stopped at the express request of the infantry commander of the infantrymen they carried. He also noted in his letter that since active operations had commenced for the regiment in January, neither of his Squadrons had failed to provide sufficient ‘Ram’ Kangaroo armoured personnel carriers, to meet the requirements of the infantry, they were to carry. He also commented, that since January, only five of the regiments ‘Ram’ Kangaroo armoured personnel carriers, had broken down due to maintenance problems prior to an attack, but that these breakdowns, had not impeded the attack or caused the infantry, not to have arrived at their objectives. 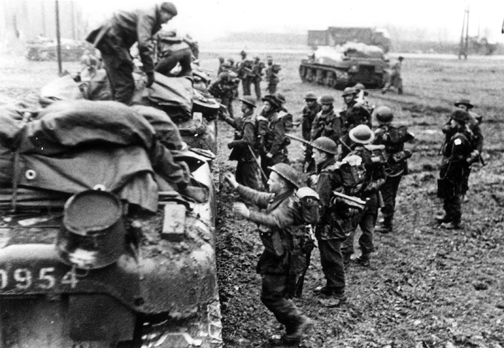 The end of hostilities in North-West Europe, on 5 May 1945, found all of the 1st Canadian Armoured Personnel Carrier Regiment, in Germany, with Regimental Headquarters, at Cloppenburg, “A” Squadron at Oldenburg, and “B” Squadron near Markhausen. 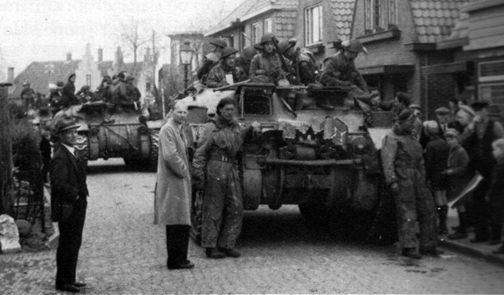 On 15 May, 1st Canadian Armoured Personnel Carrier Regiment, was ordered to concentrate at Enschede, Holland, where they were to ready their ‘Ram’ Kangaroo armoured personnel carriers, for turnover to Ordnance. The .30-calibre Browning machine guns, and wireless sets, along with all associated equipment, were to be removed, as well as all tank tools, and pioneer tools. The carriers were also to be cleaned and painted. On 11 June 1945, 52 ‘Ram’ Kangaroo armoured personnel carriers, of “A” squadron, along with three belonging to “B” Squadron, were returned to Ordnance, followed on 15 June, by the remaining 50 ‘Ram’ Kangaroo armoured personnel carriers, of “B” Squadron. Thus with having received notification of disbandment, on 12 June, 1st Canadian Armoured Personnel Carrier Regiment, Canadian Armoured Corps, 1st Canadian Armoured Personnel Carrier Regiment Signal Troop, Royal Canadian Corps of Signals, and No. 123 Light Aid Detachment (Type E), Royal Canadian Electrical and Mechanical Engineers, were disbanded, with effect from 11:59 P.M., on 20 June 1945, under authority from Headquarters First Canadian Army Troops Area, dated 17 June 1945. As of 28 July 1945, the Canadian Army Overseas12, held a total of 160 ‘Ram’ Kangaroo armoured personnel carriers, and an additional 20, that had been converted over from ‘Ram’ armoured gun towers, to that of ‘Ram’ Kangaroo armoured personnel carriers. Shortly afterwards, those that were held in vehicle parks within Holland, were handed over (at no cost) to the Royal Netherlands Army, as they began the process of rebuilding themselves, in the wake of the Second World War. Those that were held in the United Kingdom, eventually passed into service with the British Army. 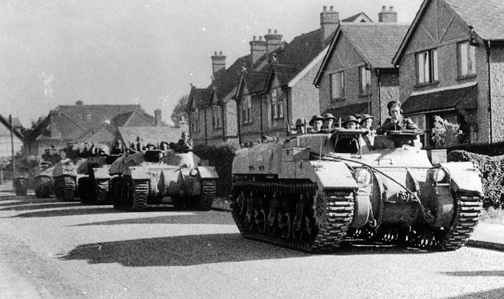 With Headquarters 21st Army Group, on 11 October 1944, having authorized the formation of a second armoured personnel carrier regiment, to support the Second British Army, the British 49th Battalion, Royal Tank Regiment (consisting of Regimental Headquarters, “A” Squadron, and “C” Squadron), was subsequently redesignated the 49th Armoured Personnel Carrier Regiment, Royal Armoured Corps (consisting of Regimental Headquarters, “A” Squadron, and “C” Squadron), with an authorized strength of 20 officers and 456 other ranks, under command of Lieutenant-Colonel N.H. King, Royal Tank Regiment, and were concentrated at Vilvoorde, Belgium, on 1 November 1944, for organizational purposes. From 2 to 7 November, as the crews of the 49th Armoured Personnel Carrier Regiment, received their ‘Ram’ Kangaroo armoured personnel carriers, they set about the task of preparing them for action. 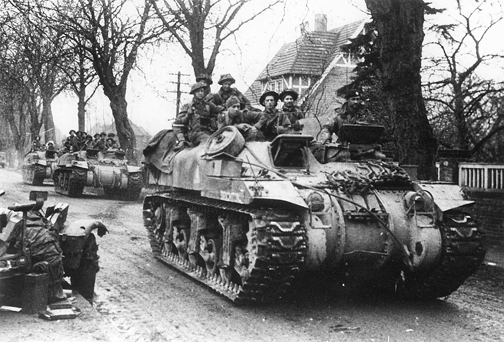 On 22 December 1944, the 49th Armoured Personnel Carrier Regiment, joined their sister regiment, the 1st Canadian Armoured Personnel Carrier Regiment, in the British 31st Tank Brigade13, of the British 79th Armoured Division14, with which they served until the end of hostilities in North-West Europe, in May 1945. The British 49th Armoured Personnel Carrier Regiment was organized, under British War Establishment XIV/1643/1 ‘An Armoured Personnel Carrier Regiment, 21 Army Group,’ with effect from 16 October 1944, consisting of, a Regimental headquarters and two squadrons, with each squadron consisting of a Squadron headquarters with five armoured personnel carriers, an Administration Troop and four Troops, each consisting of a Troop headquarters with three armoured personnel carriers and three sections, each with three armoured personnel carriers. This armoured personnel carrier allotment to the 49th Armoured Personnel Carrier Regiment, gave it the capability of lifting two battalions of infantry as follows, using one Section – an Infantry platoon headquarters and three sections, using one Troop – an Infantry company headquarters and three platoons, using one Squadron – an Infantry battalion headquarters and four companies, and with using the whole Regiment – two battalions. The ‘Ram’ Kangaroo armoured personnel carriers for the British 49th Armoured Personnel Carrier Regiment came from Ram Mark II tank stocks in the United Kingdom, previously transferred to the War Office (see Note 8), and earmarked for conversion, by the British, to Armoured Vehicle Royal Engineers. The majority of the Ram Mark II tanks transferred to the British, and then converted to ‘Ram’ Kangaroo armoured personnel carriers, were mid-production Ram Mark II tanks bearing census numbers15 between CT40101 and CT40437, and those between CT40438 and CT40937, with auxiliary turrets but without sponson doors16, although the British also converted some of the earlier production Ram tanks they had received from the CT39000 series, which had sponson doors. Most of these had the earlier ‘Vertical Volute Spring’ type suspensions with the return roller mounted in the centre on top of each bogie assembly (see the ‘Ram’ Kangaroo armoured personnel carrier, Part 1, of 16 October 2014). As mentioned earlier, an additional 330 Ram tanks, were released to the British in mid-December 1944, to meet their armoured personnel carrier needs. 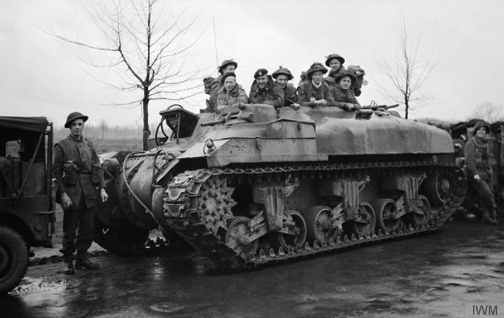 From 8 November 1944, through to 5 May 1945, the British 49th Armoured Personnel Carrier Regiment, like their sister regiment, the 1st Canadian Armoured Personnel Carrier Regiment, were actively involved in operations. In March 1945, because of the increasing demands made on the regiment, in the support of infantry operations, and at the recommendation of the Commanding Officer, Lieutenant-Colonel N.H. King, “F” Squadron, 49th Armoured Personnel Carrier Regiment, was authorized, consisting of a Squadron headquarters with five armoured personnel carriers, an Administration Troop and four Troops, each consisting of a Troop headquarters with three armoured personnel carriers and three sections, each with three armoured personnel carriers. 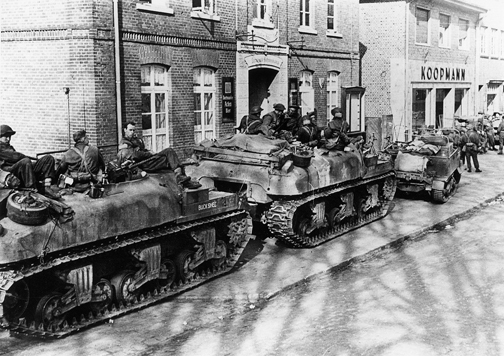 At the end of hostilities in North-West Europe, the 49th Armoured Personnel Carrier Regiment (Regimental Headquarters, “A,” “C,” and “F” Squadrons), was concentrated in the area of Hamburg, Germany, where on 10 June 1945, they began turning in their ‘Ram’ Kangaroo armoured personnel carriers to the Royal Army Ordnance Corps. The 49th Armoured Personnel Carrier Regiment, was eventually disbanded effective 13 December 1945. The British Army retained their ‘Ram’ Kangaroo armoured personnel carriers in service, as armoured personnel carriers, or as driver training vehicles, to name but a couple of roles, until approximately 1955, when they were phased out of service. From their first use on the night of 7/8 August, 194417, through to the cease fire on 5 May, 1945, ‘Kangaroo’ armoured personnel carriers had been in the van of both major and minor assaults carried out by the infantrymen of 21st Army Group. The problem of lowering infantry casualties and moving the infantry at ‘tank’ speed from start line to the final objective, had been solved. The tactical handling of infantry in the ‘advance’, working with tanks, had been revolutionized by the advent of the ‘Kangaroo’ armoured personnel carrier. Any errors and/or omissions, in Parts 1, 2, and 3, of ‘The ‘Ram’ Kangaroo armoured personnel carrier,’ is entirely the fault of the author. The National Archives Kew, Richmond, Surrey, United Kingdom – WO 24 – War Office: Papers concerning Establishments – Sub Series WO 24/954 – War establishments – 1945 January-March – An Armoured Personnel Carrier Regiment, 21 Army Group, War Establishment XIV/1643/1 (4 pages). The metal rings, within the turret ring, which have a circular track inside of them, in which the ball bearings enable the rotation of the turret. The No. 19 Wireless Set consisted of an “A” set for general use and a “B” set for short range work and an intercommunication unit for the crew. The No. 19 set had a maximum voice range of 10-miles (16-kilometres) and a maximum morse range of 15½-miles (25-kilometres). On a Ram tank, the hull pannier, was the armoured portion of the hull which extended outwards above the tracks to the outer edge of the track. In error, in early October 1944, CT159871, was issued to the 1st Canadian Armoured Personnel Carrier Squadron, Canadian Armoured Corps, from “F” Squadron, 25th Canadian Armoured Delivery Regiment (The Elgin Regiment), Canadian Armoured Corps, but stayed in service with the regiment throughout the remainder of the war, with “B” Squadron Headquarters. 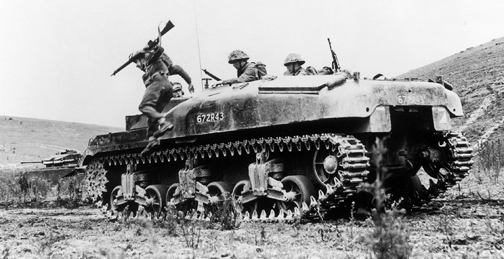 At this time, the 1st Canadian Armoured Personnel Carrier Regiment, was under command of the Second British Army. These were in addition to the 446 Ram Mark II tanks that had been transferred to the British earlier, in exchange for Sherman tanks from British stocks, as agreed upon at a meeting between Canadian Military Headquarters (London), and the British War Office, which was held on 22 October 1943. The British War Office was a department of the British Government responsible for the administration of the British Army, until 1964, when its functions were transferred to the British Ministry of Defence. A component of the British 8th Infantry Brigade, of the 3rd Infantry Division. The Brigadier, Royal Armoured Corps, First Canadian Army Headquarters, was the advisor to the General Officer Commanding -in-Chief, First Canadian Army, and officer responsible for all matters dealing with armoured formations and units, within First Canadian Army. 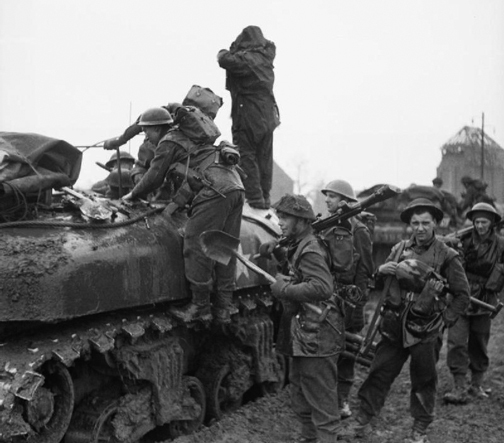 The Canadian Army Overseas was the name given to that portion of the Canadian Army that served in the United Kingdom and Europe, during the period of the Second World War. 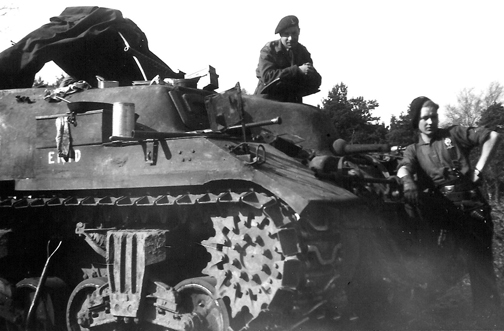 Which on 2 February 1945, was redesignated the 31st Armoured Brigade. 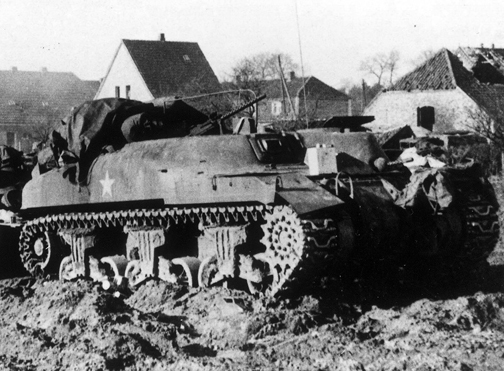 The British 79th Armoured Division operated specialized armoured vehicles modified for specialist roles. In order to provide a positive means of identifying individual vehicles, every Canadian Army vehicle was given a separate serial number, commonly referred to as census number. In the case of the Ram tank, this number was preceded by the prefix letters “CT,” the letter “C” denoting the vehicle as Canadian, and the letter “T” denoting that the vehicle was a tank. These census numbers were normally stenciled onto the vehicle in white letters 3½-inches (9-centimetres) high. A door located in the centre of the left and right hull side. See the ‘Priest’ Kangaroo Armoured Personnel Carrier, in Canadian Service, 7 August to 30 September 1944, of 28 August 2014. The Rams with black lobed turret camo are most evident on here – at 5.55mins. I didn’t realise they retained some original camo !